Ministry of Propaganda - 26/Sep/2006: "Things I Don't 'Get'"
So you have a gate, be it to your home or your business. 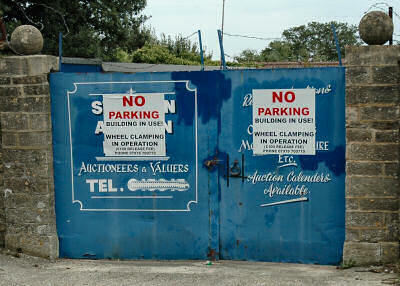 You don't want anyone to park in front of this gate, as you need unhindered access to your property. Fine, fair enough. So why do you want to prolong the blockage? Say someone parks a car right in front of the gate, nobody can get in or out of the yard. You then wheel clamp the car. Result? The car can't be moved. And still nobody can get in or out of the yard. The owner of said car might even think, now that I have to pay £100 for the privilege to park here I might as well leave the car the whole day. Or even if they are willing to pay, it will probably take a while until the company able to release the car will turn up, in the meantime the entrance is still blocked. In other words, shouldn't the sign say something about cars blocking the gate will be towed away and the owner charged for it? Wouldn't that make much more sense? Or am I missing something? PS: No, my car hasn't been clamped, not recently, not ever. At least not yet.